Kristine Anigwe scores two of her game-high 34 points. Photo by Cal.ISIPhotos.com. 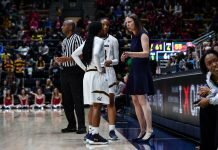 Kristine Anigwe erupted for 34 points in game one of the Pac 12 Tournament to lead her eighth-seeded Cal Bears past No. 9 USC, 71-58. With a three-pointer from Valerie Higgins, the Trojans finished erasing what had been a nine-point deficit to draw even with the Bears at 52, with less than eight minutes to play. But Anigwe and her teammates struck back. “Within ourselves, we knew we weren’t going to go home,” she said. Anigwe’s point total was the most by any player in Cal history in a Pac 12 Tournament game — and 13 rebounds, the Bears outscored the Trojans 19-6 down the stretch to advance to second round of the tournament. “Kristine played like, I think, the best post-player in the country,” said Cal head coach Lindsay Gottlieb. While Anigwe led the way with her 15th double-double of the year, freshman guard Mi’Cole Cayton and junior forward Mikayla Cowling both finished with 12 points for Cal (19-12). Junior forward Kristen Simon paced USC (14-16) with 17 points, while freshman guard Minyon Moore had 10. Both teams were plagued by turnovers early, combining for 23 in the first-half, with neither side leading by more than five in the game’s first 15 minutes. The Trojans opened up what would be its largest lead of the night with just over three minutes left in the half, with a 28-20 advantage after a jumper from freshman forward Dani Milisic. The Bears responded with a 10-0 run to end the half, to take a two-point lead into the break, and extended that run to 17 in the opening moments of the third quarter. Of that 17, 11 came from Anigwe. “I just thought our players understood at halftime what we had to do,” Gottlieb said. But USC chipped away at the advantage, and got the deficit down to three to end the third. The 3-pointer from Higgins tied the game with 7:55 to go. Mi’Cole Cayton hugs Kristine Anigwe at game’s end. Photo by Cal.ISIPhotos.com. That’s as close as the Trojans got, as USC went just 3-of-11 from that point forward, while Cal shot 70-percent over the final minutes. The Bears were able to seal it from the free-throw line, making their final six attempts from the line. Cooper-Dyke said Anigwe — who scored 23 of her 34 in the second-half — was “tough to stop,” and that her team missed some defensive assignments. The plan, she said, was to trap her. “We allowed her to get too deep in the paint,” she said. For guard Courtney Jaco, one of four USC seniors, the main issue was keeping up the energy for the duration of the game. “We knew we had to attack their pressure and once we did that and draw the help, we could pass it easily to the open player, but we didn’t have that mindset for 40 minutes,” Jaco said. That being said, the coach had praise for the way her team competed. “I’m very proud of my seniors and my team for how hard we fought all game long,” she said. With the win, Cal advances to take on top-seed Oregon State on Friday morning at 11:30 a.m. The Golden Bears are 0-2 against the Beavers this season, including a 71-56 loss in both teams’ final pre-tournament game. But having played them so recently is something the coach sees as a potential plus. “I think the benefit of having just played them is we have a really competitive group,” Gottlieb said. That game — as with each match up in the first three rounds — can be seen on Pac 12 Networks. Cal took just 47 shots for the game, just two more than its season-low (45 v. Arizona State on Jan. 20) … The Golden Bears also made just one 3-pointer on the night. Ironically, it was the first of Anigwe’s career … Cal sweeps the season series with USC, having won the only other matchup between the two, 63-56 in Berkeley on Feb. 5 … Gottleib made a point of recognizing Jaco in the post-game press conference, saying, “I just have enjoyed watching and admiring [her] for four years.” … When asked what she would miss most about playing for USC, Jaco referenced her teammates: “When you get out of college basketball, you kind of miss that camaraderie. My teammates this year were really special.” … With a 14-16 record, it’s unclear whether USC’s season will continue. While an NCAA Tournament bid is not in the cards, the team could conceivably earn a spot in the 64-team WNIT. Quinn Dornstauder had 10 points and 12 rebounds for Arizona State. Photo courtesy of Sun Devil Athletics. With a balanced scoring attack from senior posts Quinn Dornstauder and Sophie Brunner, and sophomore guard Sabrina Haines, all three of whom finished in double-figures, the Sun Devils cruised to a 72-54 win over Utah in the No. 5/12 game at KeyArena. 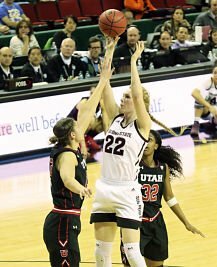 A jumper from junior forward Emily Potter gave Utah an early 2-0 lead against Arizona State on Thursday, just 13 seconds into their first round Pac-12 Tournament matchup. That was the Utes’ largest — and only — lead of the afternoon. Brunner led ASU (19-11) with 11 points, while Dornstauder and Haines both finished with 10. Potter and junior Malia Nawahine both led the Utes (16-14), also with 10 apiece. After allowing the game’s first basket, the Sun Devils went on a 12-0 run, and led by nine after one quarter. Utah trimmed that lead to three after a pair of Nawahine free-throws with less than two minutes to play in the half, and trailed by 33-27 at the break. In the opening minutes of the third, ASU expanded its lead to 15, and the margin never got down to single digits. The Sun Devils would lead by as many as 22, en route to the 18-point win. Utah head coach Lynne Roberts pointed to her team’s slow starts in the first and third quarters as the key difference on Thursday. “I don’t know if its nerves, or youth, or what, but we were playing a little tight to start both halves,” she said. Nawahine also noted the slow starts. “I thought their pressure really kind of took us out of their game, and I think at the end of those quarters, we got going,” she said. Potter, meanwhile, mentioned the challenges that came with matching up against ASU’s post presence. Freshman Kiara Russell drives on the fast break. Photo courtesy of Sun Devil Athletics. With the win, the Sun Devils advance to play UCLA tomorrow at 2 p.m. The Bruins are 2-0 against ASU this season, with a 69-60 win at home on Jan. 20, and a 55-52 victory in Tempe last weekend. Brunner said she thought her team played well in their most recent matchup. 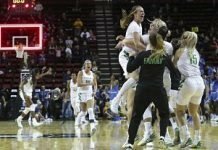 “We let them go on a run at the end of game, so being able to let them finish out games and finish it with key rebounds and key defensive stops, I think those were the biggest adjustments,” she said. Meanwhile, Roberts is confident that the Utes will also be playing on, with a spot in the WNIT. Seven points for Utah’s Erika Bean tied a season-high … While the ASU media guide notes that she was expected to miss the rest of the season, Jamie Ruden scored five points in seven minutes for the Sun Devils in her first action since suffering a foot injury in practice on Dec. 28. 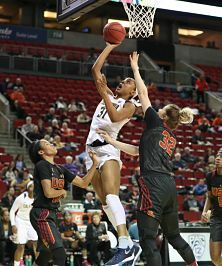 Turner Thorne said she was cleared to play, and lamented that “she’s gotten cheated out of two-thirds of her season,” after just missing the threshold for a medical redshirt in playing time … Kiara Russell’s seven rebounds were a career-high, besting her previous mark of four. It took less than five minutes for No. 10 Colorado to take a 17-4 lead over seventh-seeded Washington State in their Pac-12 Tournament opener Thursday night. By halftime, the lead was four. After a scalding hot start from the Buffaloes, the Cougars responded with an 18-0 run over a five-minute stretch spanning the first and second quarters, and took an advantage into the break. Paced by a career-high (and game-high) 23 points from sophomore guard Alexys Swedlund, 17 points from fellow sophomore Caila Haley, and freshman forward Kayla Washington’s nearly first-career double-double (12 points and 9 rebounds), the Cougars held on for a 79-78 win at KeyArena. Senior forward Haley Smith had 21 points on 8-of-10 shooting to lead the Buffaloes, while sophomore guards Alexis Robinson and Ariana Freeman had 17 and 16, respectively. After Colorado’s hot start, WSU head coach June Daugherty tried to settle her team down, calling two early timeouts. Washington State led by as many as 10 in the third quarter, but was unable to put the Buffaloes away for good. But time and again, Colorado could not convert on offense to pull even or ahead. Colorado’s final run came over the final two minutes. Trailing by eight, a 3-pointer by Alexis Robinson kept the game within reach. After Pinelopi Pavlopoulou split a pair of free throws, another three — this time from Smith — made it a one possession game at 77-74. With just 19 seconds left, two free throws by Leonard after a steal cut the deficit all the way to one. Hailey then sunk two free throws to again make it a three-point game. On the ensuing possession, Leonard drove the length of the floor for the lay-in, and drew contact that sent her to the ground, and to the line. But, that foul also knocked her out of the game, leaving freshman forward Monica Burich to shoot the free throw. She missed, but, after an extended review, the refs called a jump ball on the aftermath, with the possession arrow favoring the Buffaloes. That gave Colorado one final chance at the win. Freeman got a good look at the basket off the inbounds pass, but her shot was off the mark, and time expired. With the win, Washington State will play Stanford tomorrow at 6 p.m. for a spot in the semifinals. The Cardinal won 74-56 in Pullman, Wash. in their lone regular season matchup. Washington State wins the season series over Colorado, 2-1. 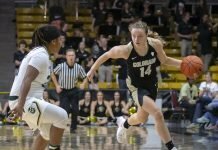 The Buffaloes won the first matchup between the two sides in Boulder on Feb. 3, 70-58, while the Cougars won in Pullman last weekend, 67-57 … Pavlopoulou tied a career-high with six turnovers, a mark set against Colorado on Feb. 3 … Both teams combined for 21 3-pointers, a new tournament record … This was the seventh tournament game in history to be decided by one point … Payne said she “absolutely” thinks Colorado’s season will continue after tonight, indicating an WNIT bid is likely in the offing. No. 6 Oregon outlasted No. 11 Arizona in a game of small runs. Two freshmen again led the way for the Ducks, as Sabrina Ionescu had 22 points and Ruthy Hebard, 21 and 12 rebounds. LaBrittney Jones put up 23 points for the Wildcats.